A senior Iranian delegation on Monday visited the General Authority of Customs in Baghdad to discuss ways to simplify the procedures for the entry of oil wells between the two countries. "The agreement was reached with the Iranian delegation on the most important points that help solve the problems and obstacles, and to tighten the control of passengers and wheels and personal baggage and activate K9 teams in their customs centers and the use of devices for the detection of drugs and psychotropic substances," the statement said. "The two sides agreed to emphasize the containers of goods and be the holder of the Iranian customs seals upon arrival in the centers of Iraq," he said, adding that the two sides agreed to find alternatives to foreign inspection companies to inspect goods at the border, especially foodstuffs. He pointed out that "the Iranian delegation confirmed the definition of 10 companies close to the Central Agency for the measurement and quality control for the purpose of selection to be adopted in the border." The statement added that "the Iranian side talked about the problem of inequality in customs duties with the centers of the Kurdistan Region," explaining that "the General Authority of Customs confirmed that it completed the file of unification of customs procedures with Kurdistan in terms of customs procedures and importation and customs duties to unite the work of customs from Zakho to Basra "He said. The statement pointed out that "the Iranian side discussed the issue of instability of customs duties, where the Authority explained that the tariff is fixed and no increase in fees, but there are decisions for the purpose of imposing additional charges to protect the local product." (Independent) .. 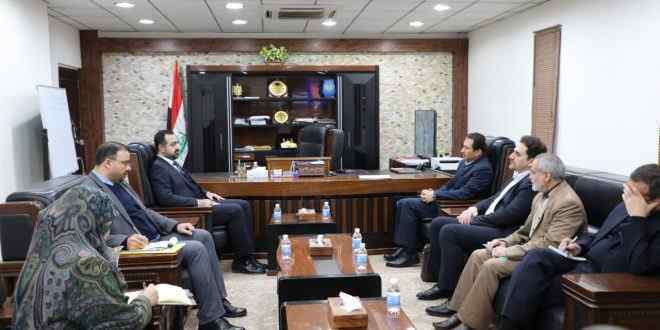 The General Authority for Iraqi Customs discussed with an Iranian delegation, on Monday, ways to simplify the procedures for the entry of wells between the two countries. The Director General of Customs, Munther Asad, met with the Iranian delegation led by the Iranian General Manager Mir Ashrafi, and included the adviser of the Iranian Ambassador in Baghdad Ahmadi Zadeh and the Director General of Standardization and Quality Control of Iran Taki Bauer. "The agreement was reached with the Iranian delegation on the most important points that help in solving the problems and obstacles and from it and tighten the control of passengers and wheels and personal baggage and activate K9 teams in their customs and the use of detection devices for drugs and psychotropic substances"
The statement added that "the two sides agreed to emphasize the containers of goods and be the holder of the Iranian customs seals upon arrival to the centers of Iraq Customs"
He noted that "the two sides agreed to find an alternative for foreign inspection companies to inspect goods at the border, especially foodstuffs, which affect the safety of society." He pointed out that "the Iranian delegation confirmed the definition of 10 companies close to the Central Agency for Quality Control and control for the purpose of selection to be adopted in the border." The statement said that "the Iranian side talked about the problem of discrepancies in customs duties with the centers of the Kurdistan region," while confirming "the General Authority of Customs that it completed the file of unification of customs procedures with Kurdistan in terms of customs procedures and importation and customs fees to unite the work of customs from Zakho to Basra"
The Iranian side also talked about his experience in the computerization of their customs system and the benefits of this program in simplifying the customs procedures, which in turn confirmed that it is continuing in the project to complete its customs work and computerization of information to simplify procedures and eliminate corruption and increase revenues "
The statement pointed out that "the Iranian side discussed the issue of instability of customs duties and explained that the tariff is fixed and no increase in fees, but there are decisions for the purpose of imposing additional charges to protect the domestic product"
The meeting concluded with the agreement between Iraq and Iran to form a joint working group to learn about the obstacles and ways to solve them at border crossings between the two countries.